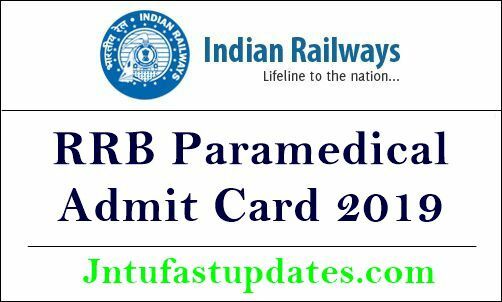 RRB Paramedical Staff Nurse Admit Card 2019 Download: Railway Recruitment Board (RRB) is going to conduct the Paramedical Staff examination shortly. Hence the aspirants applied for the RRB Paramedical staff posts can get ready for the examination. The written test will be conducted in many exam centers across India. All the applicants applied for RRB Paramedical posts must attend the exam in their allotted examination centers. The exam venue, date, and timings details can be checked from the respective hall tickets. Railway Recruitment Board is anticipated to release the paramedical staff hall tickets soon on its official portal, indianrailways.gov.in. Or the aspirants can get the hall tickets from the corresponding regional websites. Upon downloading the admit cards, candidates can go through the details printed on it. It is must to carry RRB Paramedical admit cards while going to the examination. Hall ticket verification will be strictly done at the examination centers before allowing the candidate to the examination. If any of the people fail to show the call letter he/she will not get permission to enter the exam hall. Hence all the competitors must carry the hall tickets without a miss. Railway Recruitment Board (RRB) is the national organization that works for employing the manpower for various jobs in Indian Railways. Recently, the RRB notification (CEN 2/2019) has been released for hugely 1.30 lakh posts. RRB NTPC jobs 2019 include Para Medical Staff, Material & Isolated Category and Level-1 Posts. In which the RRB announced 1937 Paramedical staff vacancies. Many of the interested aspirants have applied for the RRB Paramedical staff vacancies in February/March months. The RRB selection process includes a written test, interview, and various other supposed rounds. Candidates qualifying all those rounds with good merit will be finally shortlisted for paramedical staff posts in Indian Railways. The Railway Recruitment Board will usually activate the Paramedical staff exam call letter link before 10 days of the examination (tentatively). Candidates who are going to attend the exam can stay checking the RRB website, indianrailways.gov.in for more updates regarding the hall ticket release date. Soon, the RRB will announce the details of hall ticket availability date and other details on its portal. The hall ticket contains the information of exam date, timings, and other important details. Candidates can check all the details once after download the hall ticket. Search the RRB Paramedical Staff Hall Ticket download link in organization website. Check the information in Hall Ticket.